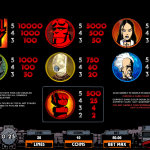 Hellboy is a popular Microgaming slot based on the mega popular comic book with the same name. We all know who Hellboy is and what he has done to save humanity from the dark forces, so it’s great to see him on his adventures again on the reels of this video slot game. The slot is well designed with a dominant red color which perfectly fits the overall theme. The animations in the game are great considering its old age. As you play the game you get a feeling like you’re actually reading a comic book, which is an unforgettable experience. The wild symbol in the slot is the Hellboy Logo and he can land across all reels. He will also double any payout he contributes in and will substitute for all of the game symbols except the scatter. The scatter symbol in the game is the Red Fist and it offers a great payout of 500 x stake if 5 of them land on the screen. Once 3, 4 or 5 of them land anywhere on the reels the Underworld Bonus is triggered. Here you will need to safely guide Hellboy through the underworld and dodge all of the guards. The goal of the game is to reach the last level and recover the Relic of Power, along with hefty coin prizes along the way. The slot also has a free spins Super Mode bonus which is triggered randomly. In this feature the player is awarded with 10 Super Spins which can’t be re-triggered. During the spins up to three Wilds will be added on the screen which will remain in position until the feature ends. 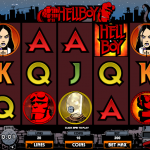 Hellboy is a great Microgaming slot which is still popular among online players. The main reason for this is the great theme and bonus features, along with the strong pay table. 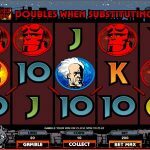 This is why Hellboy can pay big in the Super Mode Free Spins bonus. If you’re looking for something a bit more festive then you should consider playing Halloweenies a 5 reel slot by MicroGaming.